Sometimes it can be hard to be objective when deciding what makes a great motorcycle. Is it racy looks? Or handling, performance and top speed? Most of us enjoy retina detaching acceleration and cornering that may require a change of undergarments afterwards. What about value for money? Or fuel economy, affordability, reliability and ridability? If you are like me you probably think performance when you think motorbike. After all, thats what motorbikes are all about, right? The Honda CB125, known also by its platorm name as the GLH125, addresses the more practical aspects of commuting around town on a budget and leaves the performance and handling to its larger, more expensive siblings. Sure you may need to change your underwear after hitting corners at high speed but this may be more because of the CB125's commuter bike handling rather than the velocity you tackled the corner. 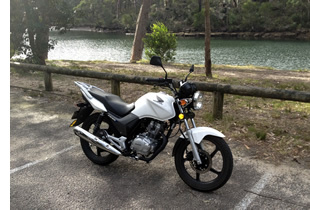 So why do I think that the Honda CB125 is such a great bike that I bought one? And then even made a website about it? Because even though I'd love a performance motorcycle I had a need for smaller, cheaper and practical machine such as this. The Honda CB125E is a perfect around town commuter. And its learner legal in most countries that impose limits on their learner riders. Although I had owned a number of motorbikes when I was younger I had never actually gotten around to getting my licence, preferring to work on the basis of simply not getting caught and promptly paying the fines when I did. Like many others learner legality was a big factor in choosing a smaller bike with the intention of upsizing to a larger machine when I finally got to an unrestricted licence. Having said that, I dont intend to sell my CB125 when I do upgrade, as a commuter machine it is pretty hard to beat. Keeping it will allow me to save wear and tear on my next ride, whatever it turns out to be. So having decided on a small capacity learner legal bike I started looking at classifieds ads in newspapers and on the internet. I found the price of second hand learner legal motorbikes a little surprising, with nothing decent available under the $AU2500 mark. When you buy a used vehicle of any kind it really can be a lottery, after all a bike with low kilometres is great assuming the owner has done the right thing and serviced it regularly. If it has travelled 15 000kms and nobody has ever even checked the oil until the first prospective buyer came along and commented that nothing showed on the dipstick (before wisely leaving) then it may not be a very sound investment after all. So I started looking at the price of new motorcycles instead. The price of new motorcycles also came as something of surprise to me, in this post GFC world manufacturers such as Honda have had to adapt and produce bikes at lower price points. The Honda CB125E is manufactured in cost efficient China rather than in Japan. Browsing bikesales.com.au searching for new dealer bikes by price turned out to be rewarding, once past the array of emerging economy scooters the Honda presented itself well as a full size motorbike at a very reasonable price. Although I was looking for a 250cc bike I felt that a 125cc might just do the job. As it had only just been released at the time reviews were a little scarce on the ground however what I read I found encouraging. And of course there was the fact that if I owned it from new I would know its service history and how it had been treated. And it would work out cheaper than buying a second hand 250cc bike by a reasonable margin. On a sunday morning I picked up the phone and rang around the Honda dealers in Sydney. I asked if they had a white CB125E in stock and if so how much would it cost if I came and paid for it on the day with the view to having it delivered sometime the following week. Action Motorcycles at Parramatta won the bidding war and came in significantly cheaper than other dealers. I have to give them full marks for their excellent after sales service, prompt registration and delivery. Theres a fair plug for you guys, you deserve it. It was time to get riding again.